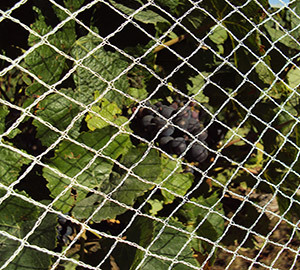 Over Row vine netting has been developed as a single row drape over net and multi row net. We stock a full range of sizes in 30 gsm diamond weave, with a unique raschel stitch to improve strength and prevent runs. Other weights and sizes are available upon request. Additional sizes and weights of Vine, Structural and Crossover Nets are available as ‘Made to Order’ – Please contact Tapex for more information. 16mm Diamond hole, 30 gram / m2. Knitted shade cloth bag with draw string. 10 season manufacturers UV warranty. Contrasting black or white centre and edge markers. Made to order service available including edge ropes.